When one thinks of Sir Edwin Henry Landseer, RA, many accomplishments come to mind. An English animal painter of mainly horses, dogs, stags and lions, Landseer’s works became commonplace in the homes of Victorian audiences, and his Lion sculptures sit proudly in Trafalgar Square to this very day. However, perhaps the most relatable Landseer artworks to our modern eye are those which depict the enduring relationship between the royal family and their dogs, a love affair which many modern pet owners can relate to. Windsor Castle in Modern Times presents such a scene and, as such, acts as a window into which we can explore both our love of Landseer and of dogs. Windsor Castle in Modern Times was modelled off a type of painting known as a ‘Conversation piece’—in which a group of people (normally family) would be positioned in an informal setting engaged in conversation, or a similar activity—and this painting by Landseer was certainly a discussion point among its royal patrons. Begun in 1840 and not finished until 1845, multiple sittings and bouts of time when Landseer appeared not to work on the painting at all meant that Queen Victoria was far from amused. Despite this, when the painting was finally hung up in her sitting room in Windsor Castle, Queen Victoria determined with no hesitancy that the painting was a “very beautiful picture, & altogether very cheerful & pleasing.” And, when looking at the painting, it’s not hard to see why the final result was received so positively. The painting depicts an encounter between Victoria and Albert, in a drawing room at Windsor Castle (a medieval castle at Windsor that Queen Victoria used as the principle royal residence), just after Albert has come back from a day out hunting. Triumphant in his endeavours, as can be seen from the game that is sprawled out across the room, Victoria greets Albert with the presentation of a small bouquet of flowers (known as a nosegay), whist their eldest child, Victoria, can be seen playing with a dead kingfisher. The scene is, of course, entirely manufactured for the conversation piece—game would not be spread out with such compositional intent in the drawing room, or spread out in the drawing room at all for that matter!—but this is a large part of the painting’s charm and success. Shown in the traditional role of royal huntsman, Prince Albert appears as an appropriately masculine figure in the home, at the same time as also representing the virtues that came with embracing a countryside life in Industrial Britain. Meanwhile Queen Victoria is depicted as a loving and caring wife and the epitome of feminine virtue—greeting her husband when he comes home in the most delicate of manner; with a bouquet of flowers—but, her position, standing in front of Albert, also makes it clear that she is the ruling monarch. All of these elements demonstrate the effectiveness of Landseer’s artwork—making the royal family look both regal, but also relatable in the eyes of the aspiring middle-class, who found themselves eager to emulate royal examples in this era. 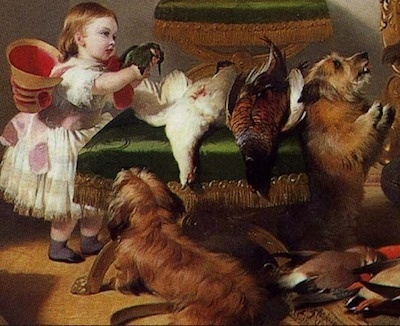 Completing the painting (and no doubt, a prevalent reason as to why Landseer was chosen to produce the work) is the inclusion of four dogs in the painting. Beloved family pets, each with their own story, the dogs in this painting add an additional level to Windsor Castle in Modern Times and, at the same time, also work to showcase Landseer’s reputation as the leading animal painter of the period. 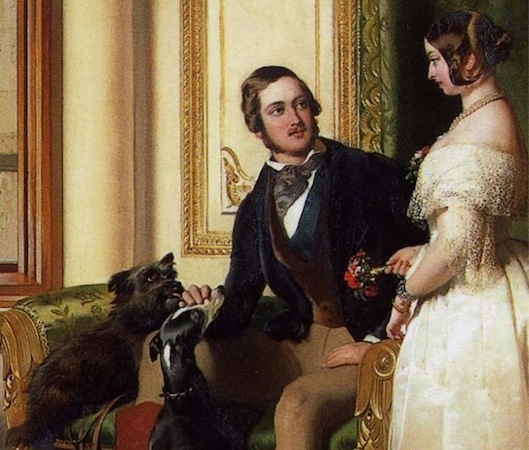 It was no secret that Queen Victoria was a lover of animals, and dogs in particular. When Landseer was given his first royal commission it was to paint Victoria’s beloved spaniel, Dash, when she was a Princess, for her Birthday. Windsor Castle in Modern Times follows Landseer’s transition into royal pet painter, and the animals in the painting are afforded as much detail as the royal family themselves. The dog at the far bottom left of the painting, nearest to the young Victoria, was a Skye terrier (a breed the Queen favored) called Cairnach—who would also go on to be painted by Landseer in 1842 as a Christmas present from Albert to Victoria. If he wasn’t well known when Windsor Castle in Modern Times was finished then he would become so over time, as Albert’s Christmas present to Victoria was reproduced and made available to the public as an engraving. To the right of Cairnach, begging eagerly as he looks up to Albert, Islay can been seen; another Skye terrier and one of the Queen’s favorite dogs. He was, in fact, popular enough that he had been painted in a previous pet portrait by Landseer, titled Islay and Tico with a Red Macaw and two Love Birds (1839), in the exact same begging pose no less! Meanwhile the ironically named Skye terrier, Dandy Dinmont, can be seen in the painting at Albert’s side, licking his hand in a faithful greeting. 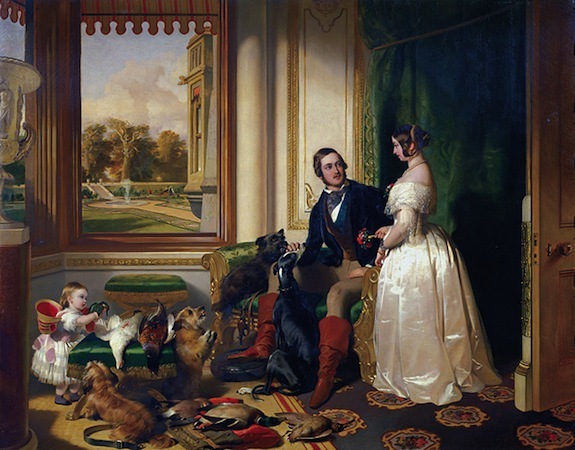 Dandy’s faithful depiction in this painting would not be the last either, as, in 1843, he would be painted by Landseer at the side of the new born Princess Alice, in a painting by the same name, as her faithful guardian. 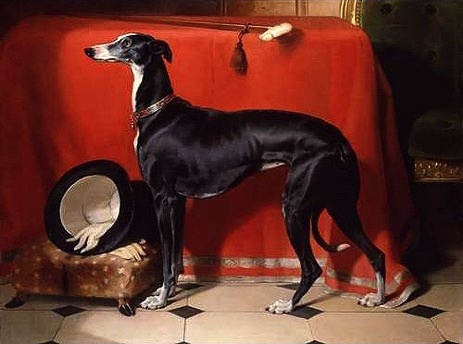 The most well-known dog in this painting, however, would certainly be Eos, the Greyhound being stroked by Prince Albert. Eos was Albert’s favorite dog and belonged exclusively to him, rather than being a family dog. This notable companion is best known for being the subject matter of the often reproduced Eos, A Favourite Greyhound, the property of H.R.H. Prince Albert (1841) by Landseer—an artwork which popularized the format of pet portraiture which followed (in pose, composition and the items included). In the same year Landseer also painted Eos with the young Princess Victoria (titled Victoria, Princess Royal, with Eos), as a birthday present to Albert. Lying faithfully with the Princess, Eos is seen here as the loyal and endearing pet that she was received as by her master. By the time this painting was finished, in 1845, both Eos and Islay had passed away, making their presence in this painting not just a dedication to man’s best friend, but also a tribute to two beloved family pets. Victorian Britain saw a notable boom in both dog ownership and dog portraiture, as dogs shifted from working and sporting animals to family pet, and this boom was certainly influenced by the royal family’s love of dogs. With both more time and money at their disposal, the newly developing middle-class found a hobby in both the owning and showing of dogs, with the Queen’s love of the animal enabling a feeling of distinction in the act, which (on the other side of the coin) also served to make the royal family seem more relatable. As such we can see how Windsor Castle in Modern Times was truly a tribute to home, hearth and hounds—effectively presenting the royal family to those who wished to follow in their example, both in moral values and in animal preferences, but also giving Queen Victoria a memorable image of her family as she wished to see it; dogs and all. Cite this page as: Amy Robson, "Sir Edwin Landseer, Windsor Castle in Modern Times," in Smarthistory, August 9, 2015, accessed April 21, 2019, https://smarthistory.org/landseer-windsor-castle-in-modern-times/.